Why rent a chair at a small, crowded salon when you can lease your own studio at Aria for not much more? And keep 100% of your profits. 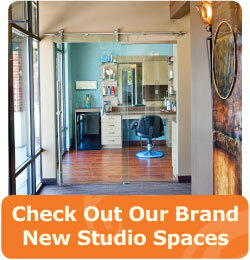 Aria Salon Studios is comprised of 18 single and double studios catering to your professional needs. As an experienced beauty professional, you have the opportunity to open your own salon without the risk of traditional startup costs. Build your business faster, at a fraction of the cost of full-scale salon ownership.